Finished reading "Garden Of Sinner" (AKA:Kara No Kyoukai) few days ago. It was a deep novel, and I'm feeling like making a wall for it, not just for my personal use, but also as a birthday gift for a friend of mine. Although there are not many good scans online for it, I still managed to find a excellent one. I've been looking for that scan since the Garden Of Sinner Offical website is up and running...So I was so happy. 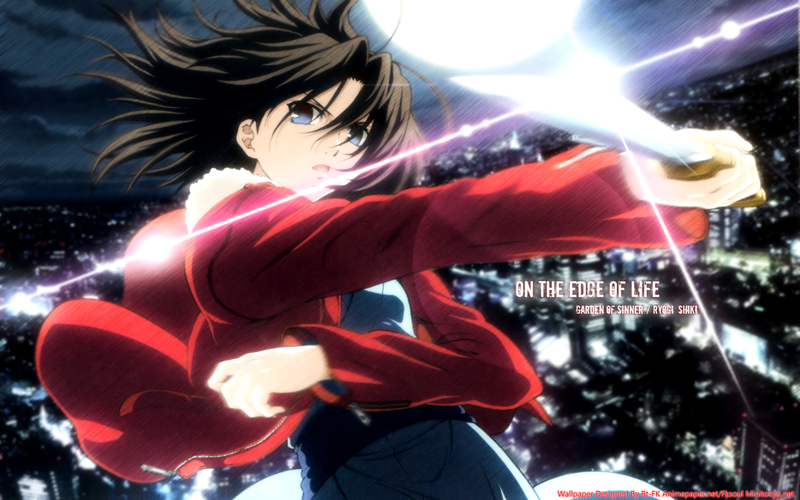 Blurred background city, create focus on Shiki herself, in the mean time trying to show the motion feeling of the entire scene. I don't like her eye colour, so I changed it, the original colour looks dull and not bright enough. This was a scene in the novel, so what I'm doing here is try to regenerate that scene, make it visualized. Textless version...I know some people will always need it. I like it, especially the light on the sword. I was impressed by this scan when I saw it in the gallery. Nice work. i love Kara No Kyokai ! I love this wallpaper so much, it's my current desktop. Do you happen to have the textless version in the same resolution as this? really cool pose~thanx for sharing! this is so damn cool. awesome! Wow it has a really cool feel to it. Good job! This is my favorite Shiki wall, I love it. Thanks for sharing, your wallpapers are really awesome.